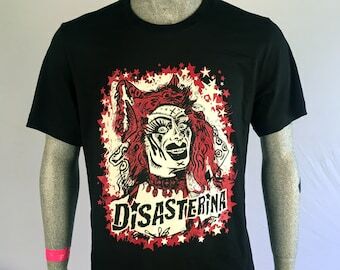 Disasterina merch! Novelties, Drag, Shirts, Art! Announcement Welcome to the Cold Sluts On Fire Shop! The official merch center for Disasterina, LA's Most Disastrous Drag Queen! Trashy counter-culture humor with hipster style. Look no further for funny, wtf, omg, lmao, and can't unsee novelties, drag, fashion, kooky art, and more! Welcome to the Cold Sluts On Fire Shop! The official merch center for Disasterina, LA's Most Disastrous Drag Queen! Trashy counter-culture humor with hipster style. Look no further for funny, wtf, omg, lmao, and can't unsee novelties, drag, fashion, kooky art, and more! I am Disasterina, LA's Most Disastrous Drag Queen! I'm a wondrous, imaginary being and my purpose is to delight and horrify! I was just minding my own trashy business and then one day, somehow I became microfamous! Now people from around da world want a piece of me...and I can't blame them! Here's where you find a legitimate piece I can break off for you! Pretty cheap too! I am LA's Most Disastrous Drag Queen and a cast member of The Boulet Brothers' Dragula Season 2. I make everything in the store by hand! I like to do fashion, novelties, jewelry, kwazy stuff, art, I LOVE IT ALL! hope u do 2! Welcome prospective adherent to the wondrous COLD SLUTS ON FIRE SHOP, the official merch depot of Disasterina! Peruse within these digital walls and find the trashiest, hippest, weirdest, merchandise and novelties this side of the Pecos (that used to be a river before global warming happened). Dive in and be sullied!